The Bold and the Beautiful Spoilers: Sally Gains Power, Liam Proves He’s No Business Leader – Steffy Takes Spencer From Liam? The Bold and the Beautiful spoilers tease that Liam’s (Scott Clifton) latest self-assigned guilt trip deeply jeopardizes Spencer Publications. By telling Sally (Courtney Hope) that his dad ordered arson, he’s foolishly given a major weapon to one of Bill’s (Don Diamont) enemies. It’s not a cliche to reference knowledge as power. That’s what Sally has now that Liam felt compelled to acknowledge what she guessed on the corporate jet. How she opts to use it can’t be known, as Liam has created a wild card. Liam sees himself as a champion of the downtrodden . Such souls often envision themselves as modern incarnations of Robin Hood. Insert eye roll GIF. This personality type doesn’t believe that the rich are robbed. Instead, they choose to believe (not think) that certain random individuals, who hold various amounts of wealth, must have gained their money unjustly and deserve to be punished. So taking their loot from them, as Liam has done is a way to rebalance the scales of injustice. Political preachers, who accept money from subjective sources, encourage taxation to accomplish the same thing as Liam. Maybe he should run for public office instead of running Spencer? Who exactly does Liam think he is, other than Bill’s son? Dollar Bill would be hurting for business if he owned a shoe shine store, as the lowly paid labor who create most of the world’s sneakers surely would attest. Sneakers are ubiquitous and don’t require spit shining. But Bill has made his family’s business profitable in changing media times, which confirms his savvy. Liam is comfortable today because his lineage created wealth. He’s never created money, instead has bent his childish emotions in order to be opposed to it. Steffy (Jacqueline MacInnes Wood) tagged Sally hard when both women traded barbs at the Spectra Fashion’s location where Sky was expected to rise. Liam’s wife told the woman who dresses hideously and sports a hair shade that’s hard on viewer’s eyes, that she was a conniver posing as a perpetual victim. The Sally’s of the world have always existed. All wrongs they’ve committed are supposed to be overlooked the moment they claim they’ve gone straight? Uh, no. So it’s time for the bottom business line. Bill was wrong to order arson and Liam has offered false hustle as his response. If Liam were truly honest and had guts, he would have turned his dad into the police, as that man should be in prison. But Liam wanted to prevent law enforcement from working so he could seize power. Sally was wronged by Bill. But the amount of money she was given and the deed to the property she’s currently having rehabbed represents more than enough so-called restitution. She should stop using Liam right now. Finally, Steffy stands as the voice of reason. She’s pulled no punches with Liam, Bill or Sally. 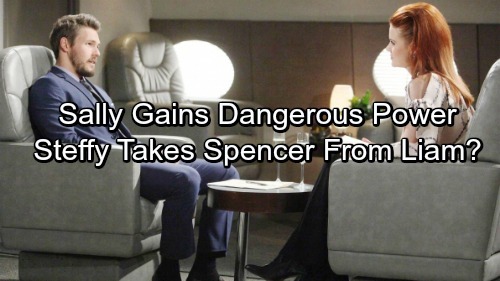 She should leave her family company and run Spencer. Steffy’s balance of brains and compassion makes her a true business leader. However, the likelihood that Liam would relinquish his power to her seems low. CDL is a leading source for everything linked to The Bold and the Beautiful. Check back regularly for B&B spoilers and news! For the story behind this cake mess, go to the #BoldandBeautiful Facebook page and watch @jacquelinemwood_1 and @thecourtneyhope ‘s live video! The Bold and the Beautiful Spoilers: Dangerous Desires Rock Liam and Steffy’s Marriage – Who Will Cheat First? The Bold and the Beautiful Spoilers: Nicole’s Future Comes with Shockers, Hot Romance – Zende Recast or Brand-New Man?